PACE Turf makes this information available as a public service to the turf management community. You can support our research and education programs by becoming a PACE Turf member today. Members also receive access to PACE Turf's award winning information service, an indispensable resource for all of those in the turf industry. Food and Agriculture Organization (FAO) Handbook 29, "Water Quality for Agriculture"
If you join PACE Turf today, you will have immediate access to weekly emailed updates, educational videos, site-specific weather and pest forecasts, and a state of the art website that will help you to prevent turf problems before they occur, save you time and money, and keep you current with the newest management products and practices. At $275 per year, or just $ 0.75 per day, it's a bargain that you can't afford to miss out on! 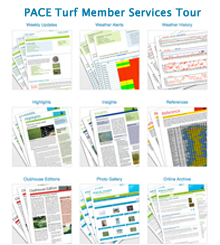 For more information on PACE Turf member benefits, please take the tour of PACE Turf member services, or read what other turf managers have to say about the benefits of membership.